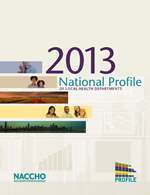 This 64-page report presents findings from NACCHO's 2013 National Profile of Local Health Departments study. The Profile is a nationwide study investigating relevant topics on local public health infrastructure and practice. The Profile can be used to make local and regional comparisons, drive policymaking, and conduct research on local public health practice.